We've made our popular compact scooter even better! We've replaced the standard seat to offer you a more comfortable, larger, 17"x17" seat standard! This new seat also comes with more comfortable armrests for longer rides. The improved Buzzaround Lite also features a standard wraparound Delta Tiller and a new control panel design with a backlit battery gauge; larger speed knob; more convenient key location and a horn button that's easier to access. The improved Buzzaround Lite still has many of the same features so popular with our previous model including the easy, three-step disassembly process - simply pop off the seat, pull out the battery pack and push the frame apart! The Buzzaround Lite still offers a 250 lb. 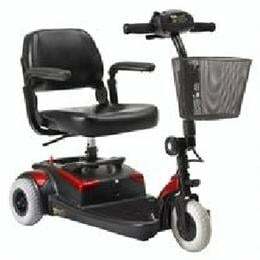 weight capacity; a top speed of 4 mph; automobile style carpeting on the foot deck; and three sets of interchangeable shroud colors in Red, Blue and Sahara at no additional charge. Ultra-compact, stylish and easy to operate! The most advanced wireless connector system for easy disassembly/assembly - no wires to worry about! Disassembles in three easy steps: pop off the seat, pull out the battery pack, and push the frame apart! 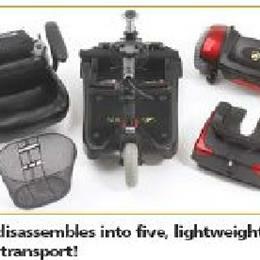 Disassembles into five pieces for easy transport - fits in virtually any trunk! Comes with three complete sets of gorgeous, quick-snap shroud colors in Red, Blue and Sahara!